Joining in hands with Mak Mobility Private Limited in India, a China based manufacturer named,”Konka” has launched it’s first Smartphone known as,”Konka Tuxedo 990″ in the gadget hub of India. Konka is an international leading CE and mobile company based in China. As per our research, we get to know that Konka is one of the top leading company serving in consumer electronics globally. Limiting the research analysis and shifting the view towards specifications, in terms of frame-up Konka Tuxedo 990 sports with 5 inches of IPS LCD Capacitive TouchScreen Display with 800×480 pixels resolution which will blonder the display with 186.59ppi of pixel density. In terms of measurements, Konka Tuxedo 990 measures 10.5 mm of thickness and weighs nearly 126 gms. A common question has been encountered while reading this news in most of the techfolks that,” why another Chinese brand, why anyone would buy, if anyone think to buy it then what will be it’s reliability” here is the answer, Konka Tuxedo holds a turnover of more than USD 3 billion and having sold more than 300 million devices worldwide which embarks it’s virtue. Dealing with it’s Platform dependency, Konka Tuxedo 990 sails on Android 4.0 Ice Cream Sandwich Operating System powered with a Dual Core processor clocked at 1 GHz. Briefing it’s Storage Specifications, Konka Tuxedo 990 packed up with 512 MB of RAM, 4 GB of Internal memory which can be expanded up to 32 GB via micro SD card slot. Konka Tuxedo has incorporated it’s Smartphone with Dual Sim, Dual Stand by technology. In terms of Image Optics, Konka Tuxedo 990 is offered with 5 MEGAPIXEL of primary camera with HD video recording and LED flash and a front camera for video calling rated at 0.3 MEGAPIXEL. Briefing it’s connectivity, the device supports 3G ( WCDMA 2100 MHz), 2G (GSM 900/1800 MHz), WiFi, GPS, Bluetooth, micro USB and a 3.5 mm Audio Jack. To power this gadget, Konka Tuxedo 990 is equipped with 2400 mAh standard Li-ion battery with 8 hours of 2G talktime and 5 hours of 3G talktime, 400 hours of standby time (2G), 300 hours of standby time (3G). 1GHz dual core processor (probably MediaTek). 5 inch IPS LCD screen with 800×480 pixel resolution (186.59ppi). 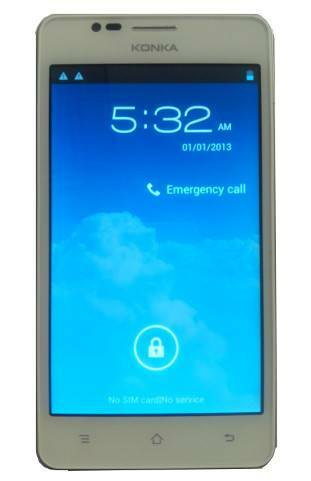 5MP rear camera with HD recording and LED flash + 0.3MP front camera. Sensors: G-Sensors, light and proximity. 2400 mAh standard Li-ion battery. The Price of Konka Tuxedo 990 is Rs 11,990 and is available for sale on all the online e-commerce retailers across the country. Opening the packet, a Handset, Battery, Charger, Earphone, USB Cable, User Manual will be made available for the users. Wicked leaked, added another device in their tablet series by introducing,"Wammy Magnus"